If you’re looking for an easy-to-make, thematically flexible and fun costume, you can’t get much better than Tetris. 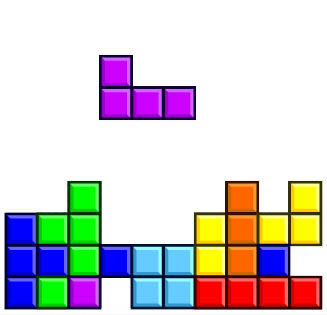 Whether it’s halloween or a party with an 80’s or computer-game based theme, the Tetris costume is easily recognisable. 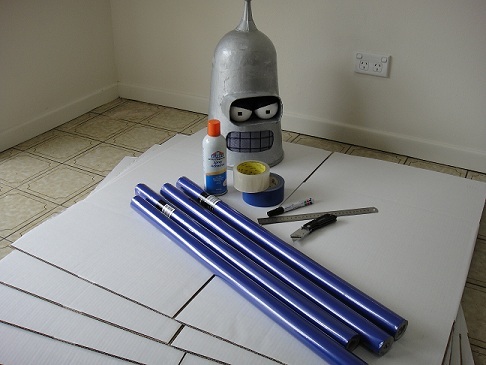 What makes this costume really great – in addition to its simplicity; is that it works even better as a group costume. I also bought some spray adhesive, but only used it to join two boxes together before deciding that it wasn’t necessary. If you prefer you can also substitute paint for the wrapping paper. There’s a lot of flexibility in this one. Using tape, attach all four boxes to each other to form the desired Tetris block shape. 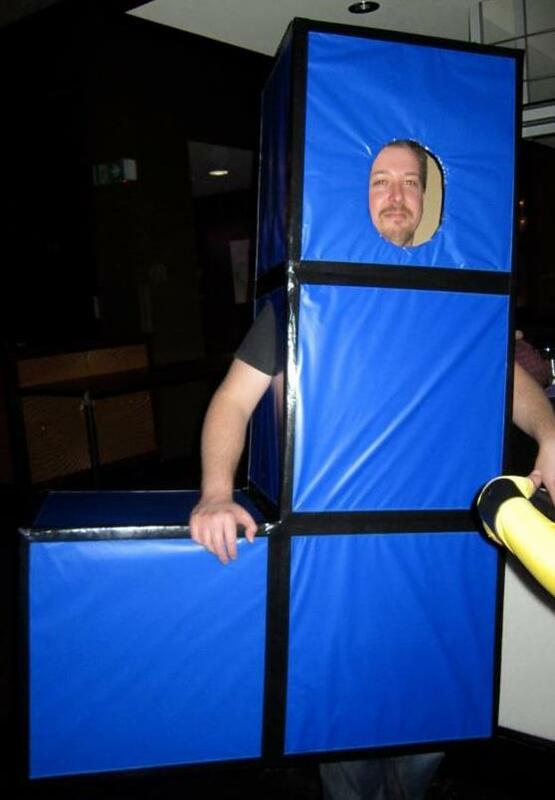 And there you have it – a Tetris costume! Naturally, more fun can be had if you can convince a few friends to join in. You can all create different blocks and have fun playing some real-life Tetris together! I’ve intentionally been a little vague on the details of the costume, but obviously this isn’t a complicated design. Personal preference will dictate whether you decide to use black tape to really distinguish your cubes or not. In the end I went with the black tape and I think it came out alright. The party was great, there were plenty of great costumes – there were even a couple of other Tetris blocks there! I was expecting a few Marios but in the end it was Pac Man that was the most common theme amongst partiers. It’s probably a good time for me to learn how to sew though – so I can sit down at the next costume party I’m invited to! jUST CURIOUS, WHAT SIZE BOXES DID YOU USE? 🙂 Sorry for the caps! The boxes I used were 50cm (just under 20 inches) square. Thank you, I’ve recently been looking for info about this subject for a long time and yours is the best I have came upon so far. However, what concerning the bottom line? Are you certain about the source? Can we say ingenious??? 🙂 I sent some Lemon Cake out this week for you! Should be arriving soon! Thanks CatMan, I look forward to receiving it! I’m wondering about starting a project to have a semi-working Rubik’s Cube costume next. I think that will be a tough one to do and again – I won’t be able to sit down! I really MUST start thinking about better costumes! We attend a fair amount of costume parties and I love the idea for the ’80s video game theme. I’ll definitely suggest this for our next party. I’m glad I could add this possibility to your arsenal! Clearly I don’t have fun friends because I have never once been invited to a costume party. Your creative mind blows me away! Thanks ET, I can’t believe that you’ve never been invited to a costume party! I’ve already mentioned to Chase McFadden that he needs a party at which to express his creative energy – maybe we should all get together and have an e-costume party!! Want to receive a lightning fast notification email whenever my mind spills onto WordPress? Click the button below! If you like my stuff, you'll love these guys and girls!